As a parent to kids on the spectrum, it can be a challenge to find easy ways to manage day-to-day life. Sometimes, running a household can drain all of your energy levels. There are several simple, year-round solutions that can be easily implemented in your daily life to help lessen the stress. While you may already complete some of these tasks on your own, it can be helpful to review some important goals. I know I need to be reminded from time to time. 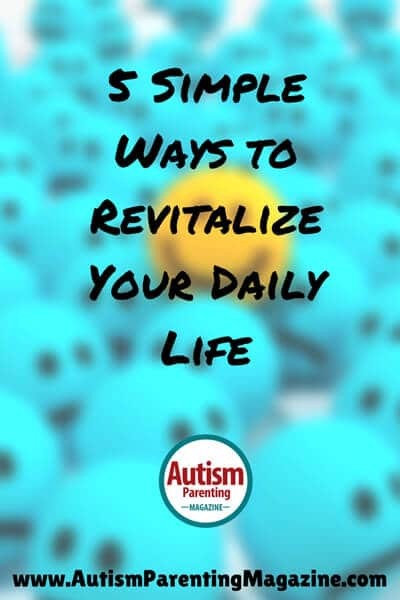 And with the kids heading back to school soon, why not revitalize your daily life now? You might find it strange that I suggest you declutter your environment in order to NOT feel drained from energy, but stay with me. Whether or not you believe in Feng Shui or energy flows in general, you know that your mind seems to be clearer when you don’t have a mess lying around. A clear environment in your house will help you to retain that energy, and it might actually help you to boost those levels, too. And this will benefit your child as well, as it makes it easier to focus on specific tasks when there’s not too much around to distract. And also the rest of your meals — preferably for a whole week at the time. Write a shopping list containing all the things you need for each dinner. Do the shopping at your local market where you’re familiar with the display of the food. That way you can also write the list according to the aisles and where the food is presented in the shop. Cross off as you’ve put the food in the shopping cart. This way you will save time and money, as you’ll only buy the food you’ll need for a whole week. In addition, you’ll be able to make a dinner list in advance and post it in the kitchen so everyone knows the menu. You can’t change what you won’t acknowledge. If you don’t open your bills and pay them on time, the thought of them will continue to sit in the back of your head, draining your energy levels faster than you can say “stop.” This is energy you need to use more wisely. This is energy your child needs you to provide for him or her. It’s about getting rid of disturbing items so that you can focus on what is needed. And now, right after school has started, your kid struggles with adapting and implementing. Keep the focus! I’m not much of a yoga teacher — I don’t do yoga myself. But I do believe in the power of breathing. When things get tough, count to 10 and take a deep breath. Actually, take several. Fill your lungs with energy and life (oxygen), and feel how your body relaxes. Parents to children with special needs tend to walk around with a high awareness alert. Your thoughts are always on trying to prevent meltdowns and other unruly situations from happening. But even with this awareness, you forget to focus on yourself first. If you don’t help yourself, you will be of no help to others. As a parent to a child with special needs, this is obvious, but so easy to forget at the same time. That’s why I include it as a final way to manage your life. And let’s be honest; during summer break, things tend to float along more. Longer evenings, later mornings, more chilling and relaxing, nowhere you need to be. Even though children on the spectrum tend to have problems with change, small changes are easier to implement. Now that Autumn is back, however, you need to draw in those reins again.